Dr. McLean specializes in medical and surgical diseases of the vitreous and retina including macular degeneration, diabetic retinopathy and retinal tears and detachments. A native of Charlottesville, Virginia, he is a graduate of Princeton University and the University of Virginia Medical School. His graduate training includes an internship at Roanoke Memorial Hospital, an ophthalmology residency at the University of Virginia, a fellowship at the St. John’s Ophthalmic Hospital in Jerusalem, as well as a vitreoretinal fellowship at the Bascom Palmer Institute of Miami, Florida. Dr. McLean is Board Certified by the American Board of Ophthalmology. He is a Fellow of the American College of Surgeons and the American Academy of Ophthalmology. He is a consulting Associate with the Duke University Medical School and the Asheville VA Medical Center. 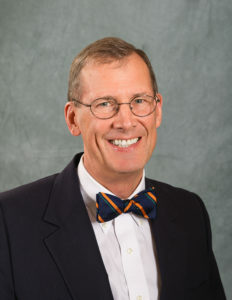 Dr. McLean joined Western Carolina Retinal Associates in 1981. He and his lovely wife have two children. His interests include spending time with his family and many outdoor activities.